4) Trump Haters Don't Get the "Art of the Deal"
19) Is the Fed Partly to Blame for Wage Stagnation? This is without doubt one of the better articles I've read on the BiggerPockets site. Brian Robbins is obviously a reader and stays quite current. I largely agree with his position. Who didn't see this coming? It's what comes of a Wild West economy called laissez-faire capitalism (meaning unregulated capitalism). In addition to the injuries mentioned in the article, people are also stumbling over stupidly parked scooters. That's why they need to be in racks when parked. I'd be fine with them if racked, if they had their own lane, like a bike path or lane, and if people were to get safety training on them before just whizzing off. The word that's missing in this article for me is securitization, it not being the US. So, how are we to know whether the whole thing is financed by banks with all their own skin in the game, liquid, and solvent? Didn't the Chinese buy in cash? ⇧ Trump Haters Don't Get the "Art of the Deal"
This article is the closest to how I see Trump's style of anything I've seen. If Trump puts a 25% tariff on Chinese imports but China then devalues its currency 25%, then the net effect is zero. The impact of the devaluation offsets the impact of the tariff and then you're back where you started. This new currency war seems to be happening. Once Trump focuses on this, he's likely to be infuriated and retaliate against China in the currency war and take steps to penalize China for currency manipulation over and above the existing tariffs and penalties for theft of intellectual property. This has a hard date of Oct. 15, 2018. That's the date of the U.S. Treasury's semiannual report on Macroeconomic and Foreign Exchange Policies of Major Trading Partners of the United States. That report is the formal mechanism for labeling a trading partner such as China a "currency manipulator" with severe consequences. The sparks come from a variety of sources: BBQs, cigarettes and increasingly lightning, which is becoming more frequent as the planet warms. 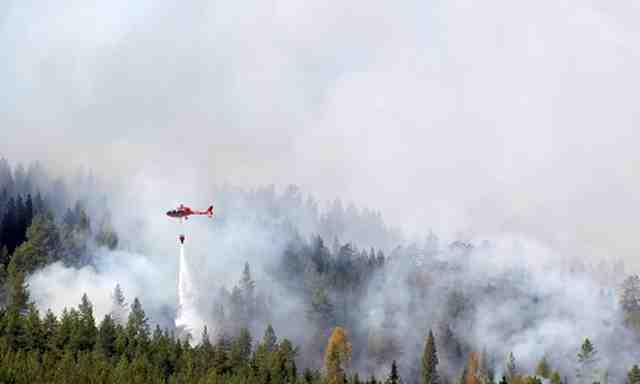 Swedish authorities say the risk of more fires in the days ahead is "extremely high" due to temperatures forecast in excess of 30C. Much of the northern hemisphere has sweltered in unusually hot weather in recent weeks, breaking records from Algeria to California and causing fires from Siberia to Yorkshire. Ukraine has been hit especially hard by wildfires. ... mainstream economics teaches that government crowds out private investment (research shows this isn't true), raising the wage would reduce employment (wrong) and that putting money in the hands of capital leads to more economic growth (also no). As we have seen post-Trump-cuts, tax cuts lead to further enrichment of the already deeply unequal, equilibrium. While I sympathize with the states' predicament, I'd be quite surprised if this effort wins. The federal government is under no constitutional obligation to have state and local taxes deductible on federal taxes. I largely agree with this and would add that assisted-living will be big, but Boomers must be able to sell their homes to move into rentals. The economy is still not very conducive to that. The linked article is nonsensical and ideologically driven rather than fact-based. It's the same old narrative that's been debunked over and over and over by historical events: proven wrong by what has happened and what is happening. It's driven by laissez-faire nonsense: deregulation, non-regulation nonsense. It's aim is to do exactly what it claims others are wrong to point out: make the rich richer without lifting the bottom. "centralized bureaucracy"? Really? The Progressive movement is localized for the most part. It is not against more housing priced by developers for the working class, far from it. What it knows is that land values are high, material is expensive and going up, and labor lacks the skills and training needed. Contrary to the article's claim, costs prohibit constructing enough units to even put a dent in prices and rents. Simply building more large and luxury units will only lower prices and rents if the owners are willing to go along with that. China has how many empty buildings and units? Why are so many living in shoe boxes then? Was it bad planning as in where the new units were constructed? That's part of the story, but plenty of units sit empty right where huge quantities of people live and work. Why are there so many empty houses and units in London while there are so many people unable to afford buying or renting them? The owners won't sell low enough, won't sell at the market rate, and won't rent them out at the real rate if one uses vacancies only as the gauge. Vacancies aren't the one and only factor, however. The linked article is written as if it were. Subsidizing rents and subsidizing development is the answer in a mixed economy. A pure capitalist economy can't work, so it's either mixed or totally public and totally democratic from the bottom up. Finally, such subsidies don't state that only non-profits may be subsidized, not even close. Add y our comment. Including the article/link number will help. ... local buyers had little experience in doing credit research, and the local debt-rating agencies lacked the kind of differentiation among borrowers found overseas. There was little need for due diligence until China began allowing defaults in 2014. "China's economic growth was largely driven by debt and its corporate debt looks like a Ponzi scheme," said Qin Han, chief fixed income analyst at Guotai Junan Securities Co.
Let me caution readers that the linked article is written with federal laws in mind. Always check state and local laws and regulations too. In addition, the article is far from exhaustive, though it doesn't claim to be exhaustive. This article helps support my points raised two links above. Progressive regulations aren't the reason for this situation. Deregulation would only result in shoddy construction and building in higher-risk areas without informing the buyer or renter of the dangers. Fact: If Huston had, had more progressive building codes and zoning restrictions in place along with flood-control and mitigation regulations and enforcement, the city would have suffered much less damage from Hurricane Harvey. It didn't have those things in place because libertarianism held sway instead. An EF2 classification tornado ripped through the Prairie View RV Park in Watford City last week, killing a newborn baby and injuring more than two dozen people. Please take strong note of the fact that the local government is acknowledging that strong zoning is needed and would have helped. That's the opposite of deregulating. Proper risk-management is the opposite of deregulating. Deregulating for the sake of laissez-faire capitalism is the worst of the worst in risk management. It is the absence of risk management. It is throwing caution to the wind and reaping the whirlwind. It results in more dead babies, as McKenzie County knows only too well. Please also note that the article didn't mention the direct link between oil drilling, carbon burning, global warming, and more and more severe tornadoes. Trump helped usher through a massive tax cut late last year that slashed the corporate rate from 35 percent to 21 percent and lowered marginal rates across the board. In return, the president has delivered powerful stock market gains and an economy on pace to grow nearly 3 percent in 2018, well above its post-recession rate before he took office. Powell has said he believes the economy is strong enough for the Fed to continue on its path of normalizing rates, which were held at a historically low level during the recovery. Still, Trump said he's concerned that the timing may be poor and that it will put the U.S. at a "disadvantage" while the Fed's counterparts like the European Central Bank and the Bank of Japan maintain loose monetary policy. The whole thing is sleight of hand. Trumps corporate-tax cuts have gone into stock buybacks, not the real economy, not into research and development, only boosting executive compensation for doing little to nothing truly productive. Also, the cuts for the poor are fleeting and still way too small to really help the economy. Lastly, the Fed's independence is the problem, not something to be protected. The Fed should be abolished. The central bank should be nationalized and democratized at the grassroots level. Then we could really fix the economy to run at peak performance without cycling from boom to bust and back endlessly. U.S. District Judge John Keenan dismissed the city's claims against Exxon Mobil Corp., Chevron Corp., BP Plc, Royal Dutch Shell Plc and ConocoPhillips, ruling that the federal Clean Air Act controls carbon dioxide emissions and blocks suits such as New York's. The problem with that argument is that the US EPA is not enforcing the Clean Air Act in terms of CO2 emissions and resulting environmental risks and damage. Therefore, New York must seek to force the EPA to enforce the Clean Air Act as interpreted by the federal court. "The piling on of evidence is worrying me," he said. "This is the kind of stuff you don't want to be right about." ... there is no shortage of skills associated with credentialed workers in the economy today. ⇧ Is the Fed Partly to Blame for Wage Stagnation? The Fed's recent willingness to tolerate plunging unemployment and accelerating inflation suggests Powell might want to undo some of the effects of his predecessors' policies. Say what? "Plunging unemployment" with plenty of labor slack remaining with little to no real price-inflation. Where are the wage gains outstripping productivity gains? Let's not be impatient. Speaking of impatience, the Fed keeps raising rates and threatening to continue. That doesn't sound like tolerating accelerating inflation but rather prepping to bring on a recession. "Is the Fed Partly to Blame for Wage Stagnation?" Of course it is. It's the whole point for the Fed's existence: systemic unemployment for the sake of the bankers. Did somebody claim that programs such as this one can't be utilized by for-profit developers? Where does it say for-profit developers aren't allowed? I wrote back in 2009 that unemployment should drop to 3% and price inflation should reach 5% before the Fed ought to start trying to slow things and that if the Fed doesn't do that, it will make the recession longer, recovery harder, and lead to another recession. It has been ten years since the last major financial crisis. With systemic deregulation undoing the safeguards, we are due for another crisis very soon. Thomas Hanna, research director of the Democracy Collaborative's Next System Project, says it is almost guaranteed. Add your comment. Including the article/link number will help. I don't usually weigh in on such matters via this blog; however, I want to place my idea here. Email is often spam. It is often legitimate spam. The link to unsubscribe or to opt out is often exactly as it is supposed to be according to the law. However, that system is actually broken due to malicious links in emails. Therefore, what is needed is a central clearing-house for spam opt-out links. Every sender of unsolicited email should have to use the one central-clearing house to handle such opt outs. That way, email recipients would be able to trust the domain of the opt-out link. The idea is original with me whether it has also occurred to others. It always seemed to me that Trump didn't understand monetarism from a progressive position. He seems to have read or heard enough now to understand at least some of the fundamentals. However, it has also seemed to me that he picks people from money and then tries to get them to change their minds to his way of thinking. My view is that he does that because his feet are clearly in the non-science camp. He likely can't see himself choosing progressive economists while still being laissez-faire on climate. I told everyone right from the start that austerity is exactly backwards. I was not alone, but it was lonely in that there were really so few of us. At a time of mounting uncertainty in Europe, Portugal has defied critics who have insisted on austerity as the answer to the Continent's economic and financial crisis. While countries from Greece to Ireland — and for a stretch, Portugal itself — toed the line, Lisbon resisted, helping to stoke a revival that drove economic growth last year to its highest level in a decade. The only mistake Portugal is making, which the US is still making too, is not enough stimulus in the right places. It's actually quite simple. Don't let them fool you. Economics is not difficult. Proper economics requires mostly basic arithmetic and a tiny bit of algebra (first-year high school). Businesses and homes had gaping holes, some with roofs torn off or collapsed inward. It will be interesting to see how a different judge handles the issue. This entry was posted in Editorializing, General News of Interest, General Real-Estate News, News-Alerts Digests. Bookmark the permalink.